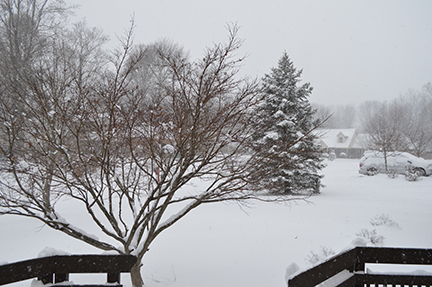 Hope you’re staying warm wherever you are. Our chapter of the Louisville Modern Quilt Guild plans to have a booth at Quilter’s Day Out March 15. Back in November, our challenge was to make 12-inch blocks using the colors of the Modern Quilt Guild logo, which if you’re interested, you can find here. You can see some of the blocks the members made here. After putting up the blocks on a design wall, we thought it would be a great idea to make four additional blocks, each one featuring an initial of our guild name. 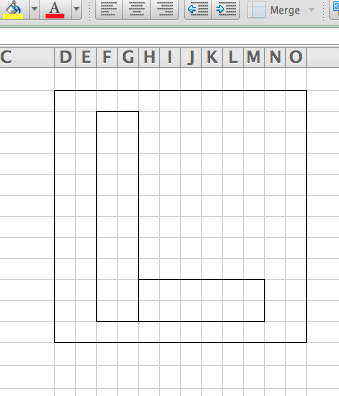 I volunteered to make the L. And, in typical fashion, I procrastinated doing this until the day before it was due. I had some ideas in my head, but wasn’t sure exactly how I wanted to size things. 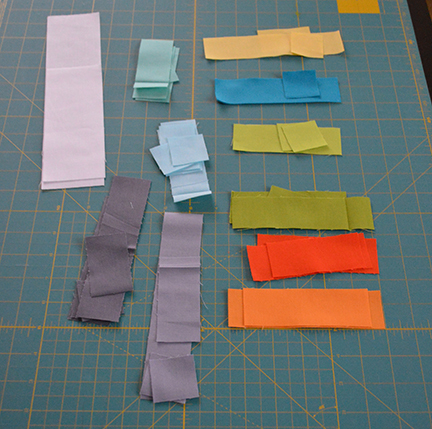 I had several 1.5-inch strips left over from the block I made for the quilt, so I knew I wanted to use those up. 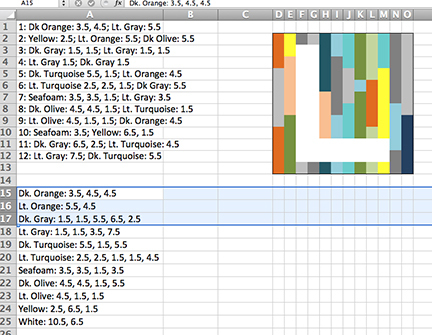 Going into my trusty Excel, I resized the columns and rows to get an even grid, and drew a box around a 12×12 section. 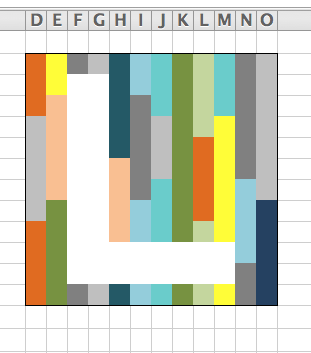 Then I used Excel’s border feature to create the shape of the L.
I wanted to use a little of each color and I liked the idea of the letter standing out from a rainbow of colors. 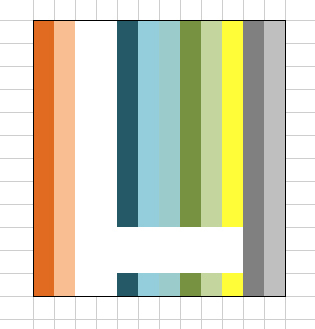 But since there are only 10 colors in the logo, and this will be a 12-inch block, that meant I had two spaces left over. 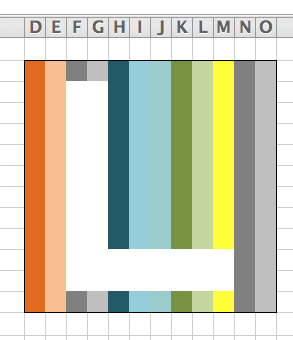 I thought about making the L a little funky by making the bottom squares white, but I just didn’t like it. Then I tried repeating the gray colors on the end since there was so little of them. Still, it just didn’t quite work. So I tried mixing the colors, which worked much better. Then it was time to cut and sew. I placed them together to see how they’d look, just to make sure I was happy with it. Some of the strips wound up uneven in my attempts to trim and square pieces up, but that’s ok with me. The wonkiness just made it feel even more modern! 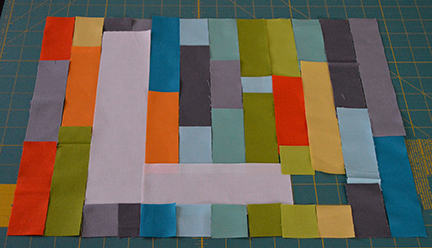 Here’s how it looked with the blocks our members made, which we plan to turn into a quilt banner for our booth at Quilter’s Day Out. Pretty cool, when put all together, isn’t it? 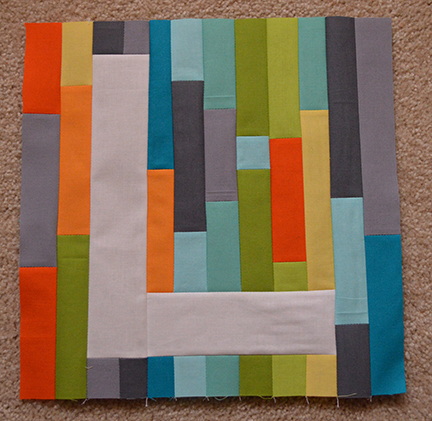 Overall, I’m really happy with how my L block turned out and even think it might be fun to do as a quilt-along. What do you think? 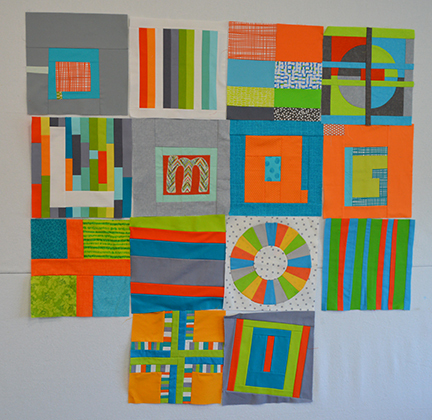 Would you be interested in having blocks like this to do an alphabet sampler quilt-along? Let me know in the comments. Hope you’re all having a great week. 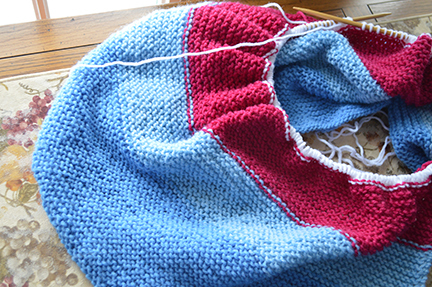 I’m also making progress on my latest charity blanket. I’ll have photos of that soon. I decided to make this blanket larger than my last one, but still small enough for a baby or toddler. I got the idea from one I saw on Pinterest, made by LaLaKa and found on her Etsy store. 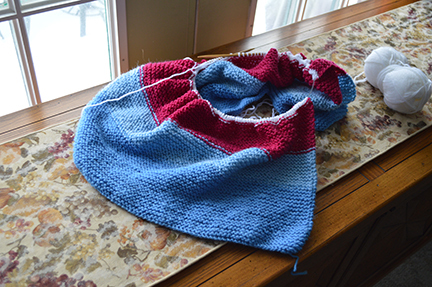 I’ll admit, what particularly interested me was that all I had to do was knit, which was the perfect mindless project for my infirmed state of the past few weeks. The yarns have been in my stash for quite awhile, and a couple of the skeins are missing labels, but it’s mostly Emu Superwash and Brunswick Yarns Wintuk Orlon for the darker blue. 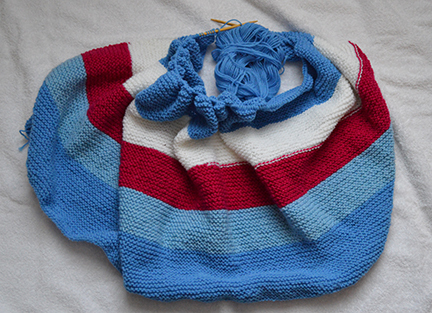 Definitely easy knit and easy care. 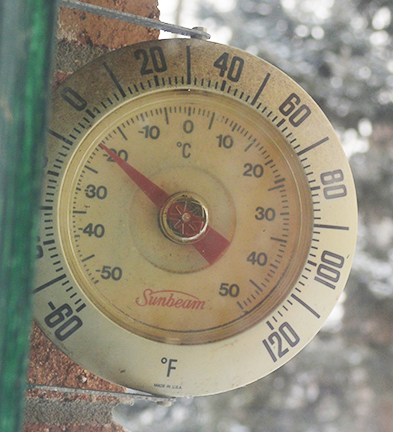 It’s also a perfect activity for the below-zero temps my outdoor thermometer shows today! 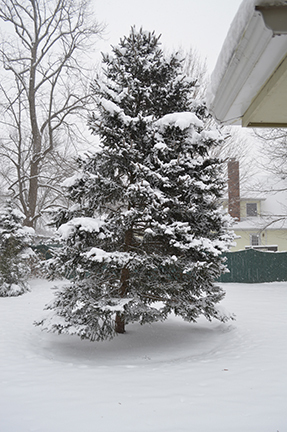 Here’s hoping you all had a wonderful holiday; thanks so much for stopping by. Hi! My name is Sandra Louise, and I've made at least a million stitches over the years. 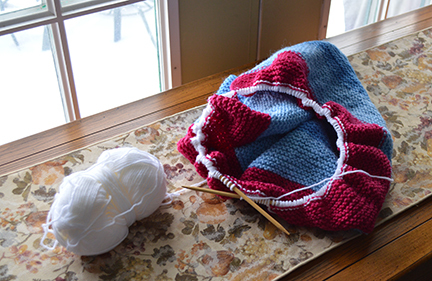 This blog is a way to share my devotion for just about all things stitch-related. Thanks so much for stopping by! 2011-present by Sandra Louise. Feel free to link to this site, but please don't use any content or photographs without my permission. You can also pin items to Pinterest, but please link back to this blog. For any questions, email me at onemillionstitches@gmail.com. Thank you! Try not to notice the blurry photo. Focus your eyes on the gorgeous Art Deco style fabric instead.